The 10 Minute Trainer workout is on sale for the month of August! This is another fantastically effective fitness program by trainer Tony Horton, creator of P90X, P90X2, and the new P90X3. 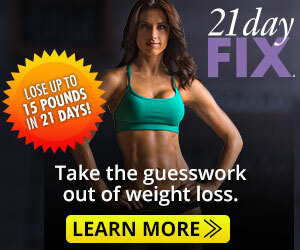 This program is great for all fitness levels and Tony Horton is a great and entertaining motivator. In the videos he works with only one person, who’ll show you exactly how to do each move. It’s almost like having Tony in your living room as your personal trainer! If you have a super-busy schedule, this is the one you should try. With Tony’s Super Stacking method, you can get the body you want in as little as 10 minutes a day! That’s because the 10 Minute Trainer workout was made to help you get better results in less time. On days when you have more time you can even do 2 or 3 workouts. Don’t worry, the schedule will tell you exactly what to do. You’ll build muscle and shed pounds in no time with power-packed workouts—and lose fat even faster by adding the resistance band and cardio belt, which come free with the fitness program. I’ve done this program too, before T25. Let me tell you, if you think 10 minutes isn’t enough time to get in a good workout, you couldn’t be more wrong! I did pretty well with the strength workouts using the resistance band, but those cardio days were intense! Early in the program I had to pause the dvd in the middle of cardio. So, even if you aren’t a beginner, you WILL get a good workout! Your first 30-day supply of Shakeology®—the superfood shake that helps give you energy, reduce cravings and accelerate your fitness results. A FREE 30-day VIP trial membership in the Team Beachbody® Club. Exclusive Bonus Workout—Tony’s Fountain of Youth yoga. A $19.95 value—FREE! You’ll get me as your Personal Fitness Coach! Try 10 Minute Trainer Workout Challenge Pack!